What is so startling about the Iliad is its immediacy, its emotion. Real, recognizable feelings and behaviors are so evident that the fact they happened in a time before Christ just falls away. We find ourselves rooting for these men and women even as we see the plotting of the gods and they obvious way they place a thumb on the scales of justice. Once one has gone even a little way into the Iliad, one’s curiosity blooms: how can this story have survived? what is its history? are there more stories? how did people learn this story? One wants to talk with someone else about the book, someone knowledgeable, a teacher perhaps. Alexander obliges, but she is interesting not just for first-time readers. She has her own translation of the Iliad, and has a vast understanding of the other works from this time, as well as the culture. The stories of the Iliad and the Odyssey may never really leave one after an encounter with them. There are darn few pieces of literature in history that have that kind of impact. It is endlessly interesting to read new translations and go through the whole thing again every couple of years, listening to debates about who does it best. This has gone on since they were first delivered orally. Alexander’s book indulges that curiosity, leading a discussion of points we raced past in the midst of discovery. I thoroughly enjoyed reading this in conjunction with this latest reading: this time I listened to Stephen Mitchell’s version, read Peter Green’s, and consulted all the earlier versions. I really loved the new translations but think I may prefer Fagles above the others. It is just so easy to get stuck into poetically, and the edition, I have to admit, is so luxurious and pleasing with its deckled edges and parchment-colored paper (as opposed to white). It is easier to turn the pages, which is something which frankly never occurred to me before. It is lightweight. In a book of this size, that is something. If you notice that the spelling of character’s names in my various reviews of this book are all over the place, just understand that practically every translation of this book has a different set of spelling concerns. Today one can guess which edition others are reading by the way they spell characters’ names. I happen to love this diversity. It adds to the awe-struck understanding that this work has been translated endless times by endless people and makes one wonder: how has it changed over time after being touched so much? The sumptuous funeral accorded Patroklos accords with heroic burials in different cultures from different ages, allowing for the input from cultures who enjoyed the Iliad after its initial introduction. The detail of the burial is consistent with the pattern of archeological evidence. Alexander shares a discovery in 1980 on the Greek island of Euboia of an Iron Age burial site the owner wanted for a vacation home. It was the site of a heroic burial dating approximately to 1000 B.C. which contained the bones of a 30 to 45-year-old male wrapped in a fine linen robe buried alongside a woman adorned in gold. This is close to Homeric times and provides evidence that heroic burials as described in the Iliad happened at least from this Iron Age site. Alexander is able to bring many of the questions we have together in one place while referencing scholars who have tried to answer. 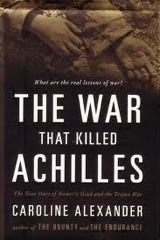 She acknowledges the Iliad has been called the “poetry of combat” but she says it is not merely “impersonal slugging matches” but personalized heroic deaths, giving life to men at the moment of their death. It makes me weep to think of it. And yet, Alexander points out that the Iliad insistently humanizes the enemy, despite recording endless pathetic deaths: three times as many Trojans die as do Achaeans. We have sympathy for the Trojans. This is the way the book is written. And this, dear friends, is how we know that man is not merely a greedy sod out to “win” what they cannot ever truly win, for time erases glory made of gold. This is a very worthwhile accompaniment to the great Iliad. Thank you, Caroline Alexander and Viking Press for a truly interesting and inspiring work of scholarship.